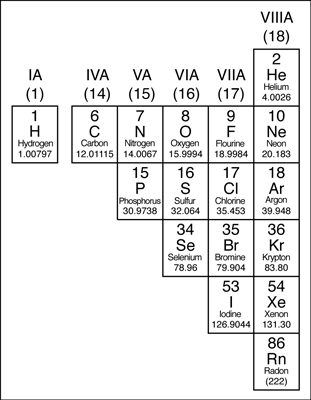 Using the periodic table, you can classify the elements in many ways. One useful way is by metals, nonmetals, and metalloids. (See also The Periodic Table: Families and Periods.) Most of the elements on the periodic table are classified as metals. 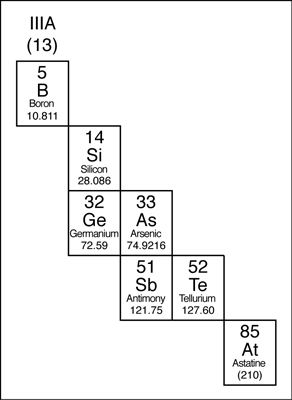 In the periodic table, you can see a stair-stepped line starting at Boron (B), atomic number 5, and going all the way down to Polonium (Po), atomic number 84. 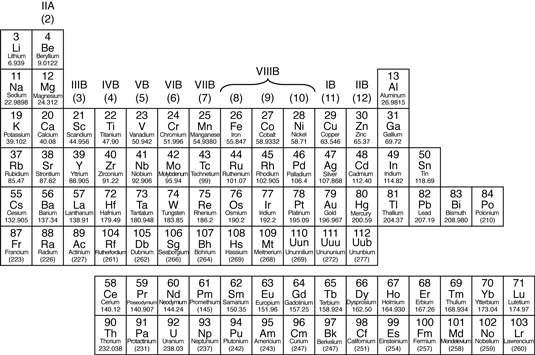 Except for Germanium (Ge) and Antimony (Sb), all the elements to the left of that line can be classified as metals. They are solid (with the exception of mercury, Hg, a liquid). They are shiny, good conductors of electricity and heat. They are ductile (they can be drawn into thin wires). They are malleable (they can be easily hammered into very thin sheets). All these metals tend to lose electrons easily. The following figure shows the metals. The metals in the periodic table. Except for the elements that border the stair-stepped line, the elements to the right of the line are classified as nonmetals (along with hydrogen). Nonmetals have properties opposite those of the metals. The nonmetals are brittle, not malleable or ductile, poor conductors of both heat and electricity, and tend to gain electrons in chemical reactions. Some nonmetals are liquids. These elements are shown in the following figure. The nonmetals in the periodic table. The elements that border the stair-stepped line are classified as metalloids. The metalloids, or semimetals, have properties that are somewhat of a cross between metals and nonmetals. Metalloids tend to be economically important because of their unique conductivity properties (they only partially conduct electricity), which make them valuable in the semiconductor and computer chip industry. The metalloids are shown in the following illustration. The metalloids in the periodic table.